This fixed gallonage fog nozzle is a simple and rugged self-educting foam nozzle with superior stream quality and reach. The fog angle is user adjustable between wide fog and straight stream. 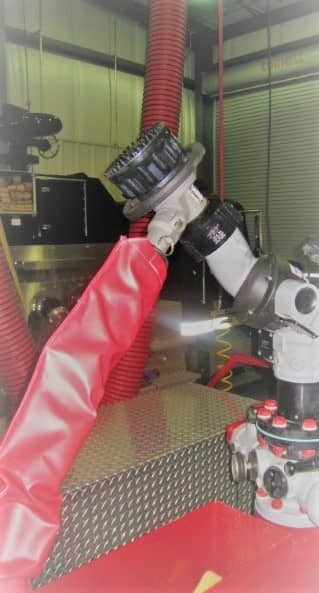 The nozzle’s baffle is easily removed for flushing debris. Models are rated at 100 psi (7 bar) and are available in two versions. The smaller version is available in 250, 350, 500 or 750 gpm (950, 1300, 2000, 3000 l/min). The simple flow geometry can educt foam concentrate at .5%, 1%, 3%, or 6%. The larger version is available with your choice of 1000, 1250, 1500 or 2000 gpm (3800, 4800, 6000 or 8000l/min). The standard swivel coupling is 2.5” NH female threads with customer specific threads available upon request, at no extra charge. The simple flow geometry can educt foam concentrate at 1% or 3%.